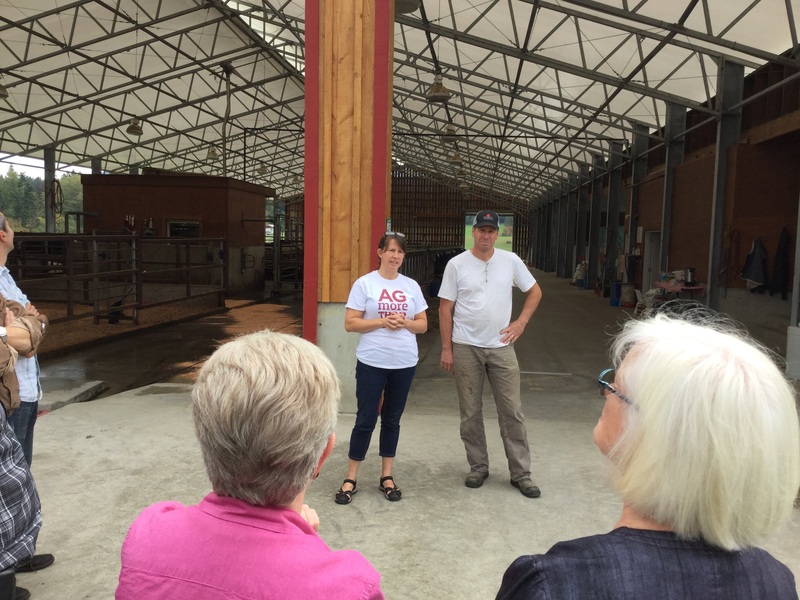 I had the pleasure of joining the Cowichan Agricultural Society’s (CAS) farm tour on Friday. 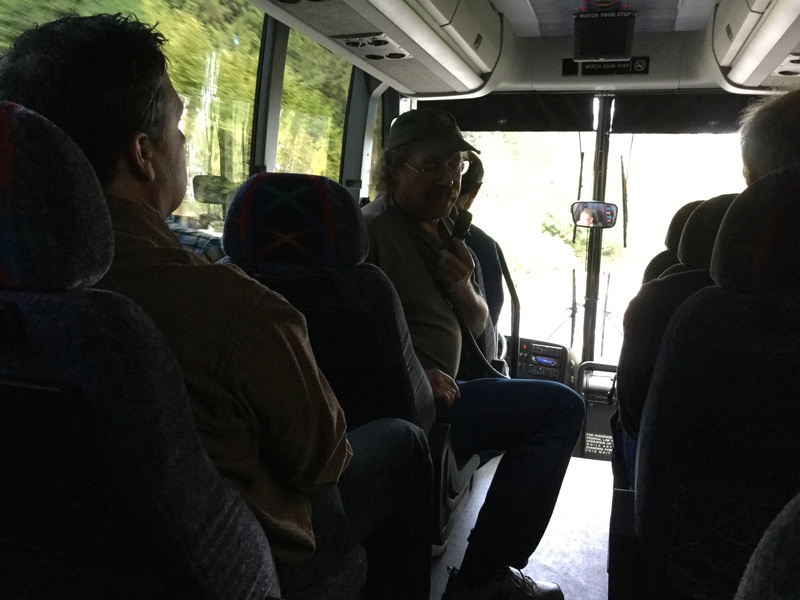 A bus full of farmers, Farm Industry Review Board members, municipal and CVRD staff members, Ministry of Agriculture employees, and politicians visited 5 agricultural operations around the Cowichan Valley. At the end of the tour, we were given a feedback form to let the organizers know what we thought. Here’s what I thought: the farmers in this valley are innovative business owners. 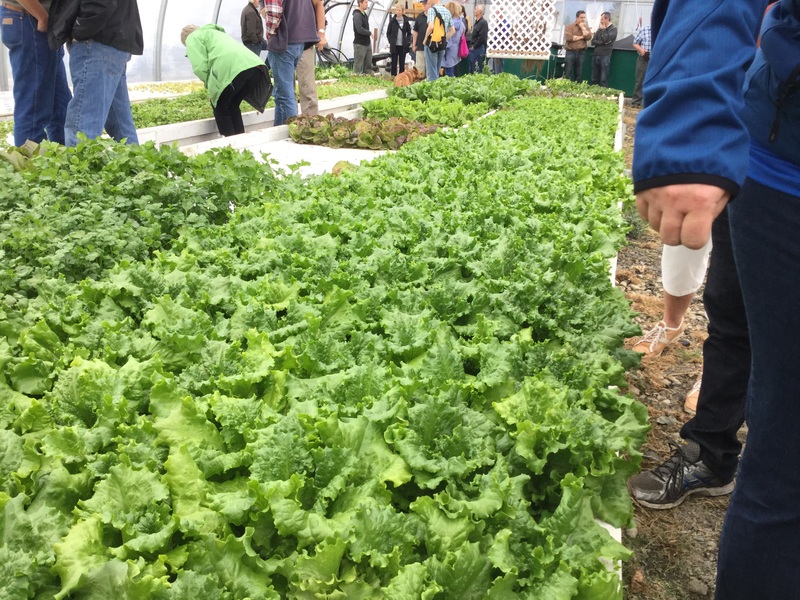 They are challenging the status quo in farm practices, and their creative thinking is inspiring others to do the same. I can’t wait to see what these and other farmers do next. 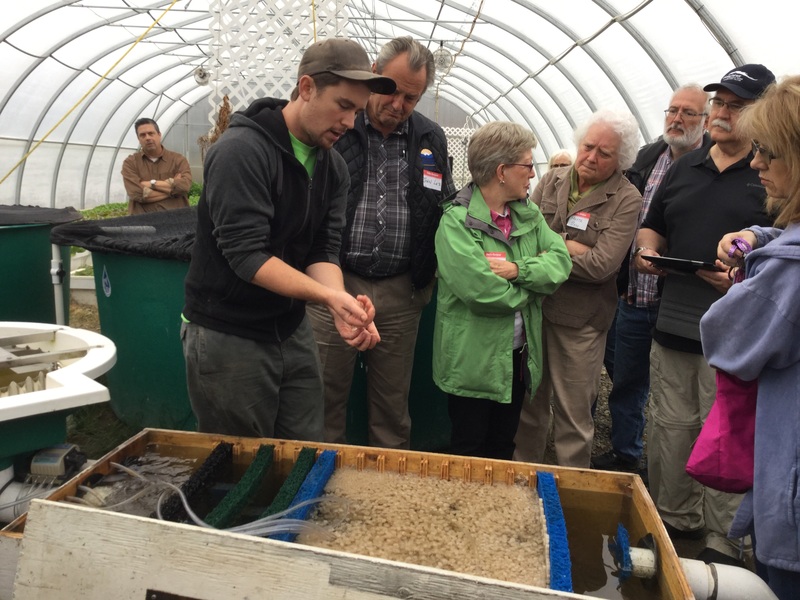 Our first stop was Raincoast Aquaponics. Adrian Southern is the resourceful owner and operator of this inventive operation. 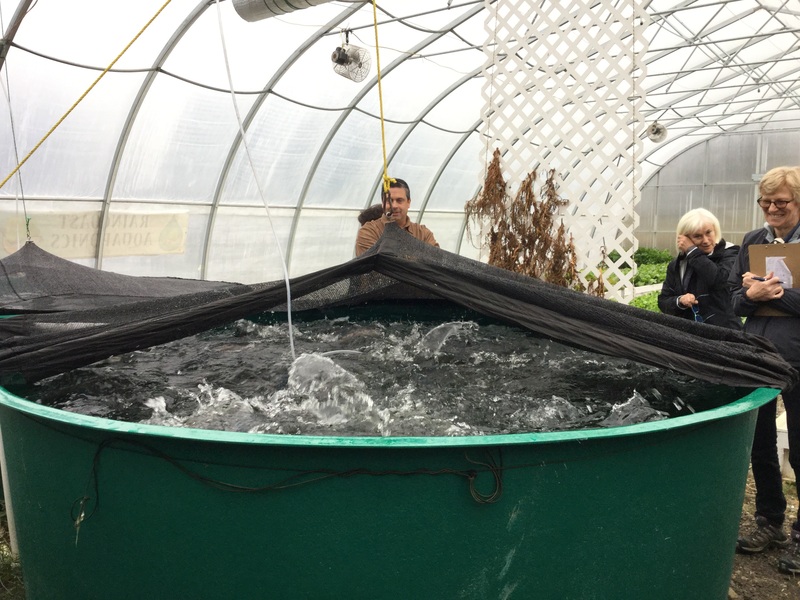 Adrian explained the process of raising fish in a barrel of water, then passing their biomass (fish poo) through a series of filters before sending the resulting ammonia-rich water to irrigate lettuce that is grown in small pods inside the greenhouse. The fish get excited for feed. Our next stop was Farmer Ben’s egg-production and packaging facilities. 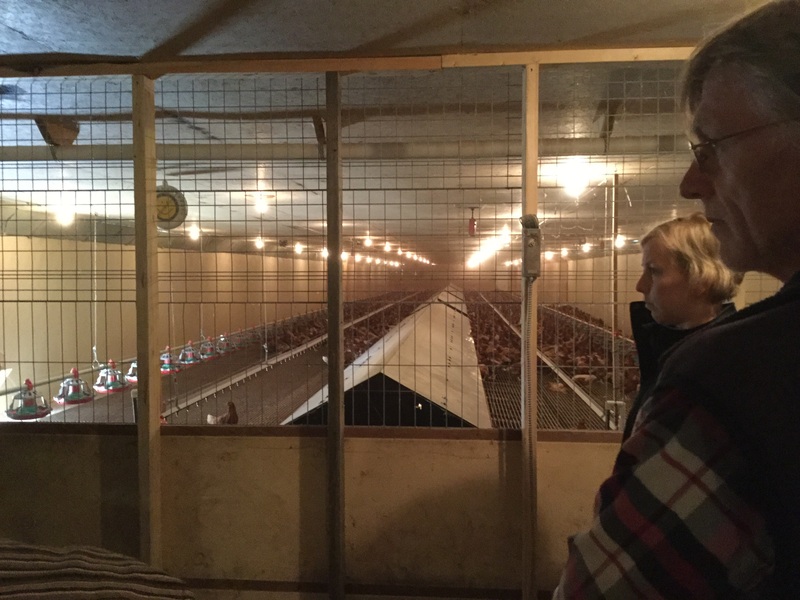 Owners Jen and Ian Woike‘s hens produce 14 million eggs per year. 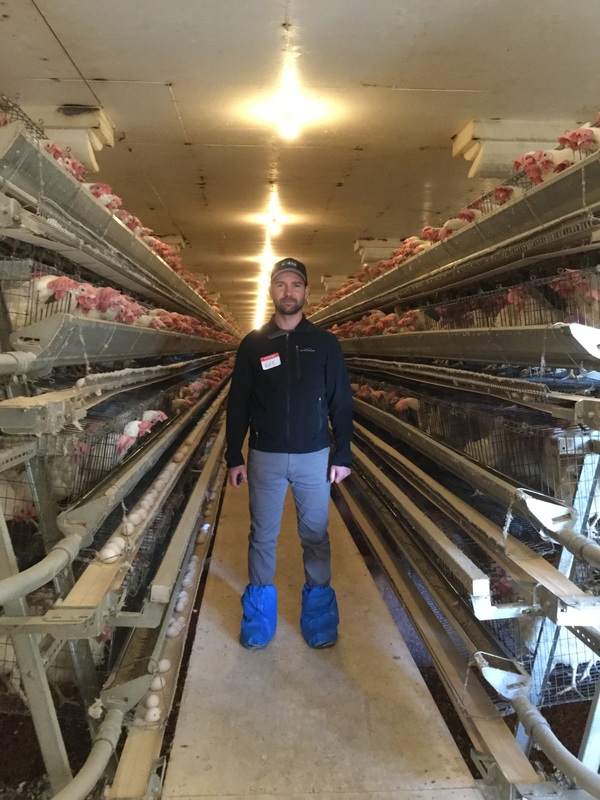 They keep caged birds, though recently Ian built a free-run barn to meet consumer demand, and they anticipate building another. Given the threat of avian flu and its immediate and devastating affect on a flock, we had to wear special booties to keep any unwanted and unseen germs at bay. Fetching look, yes? Our next stop was lunch. The Somenos Women’s Institute served us a most-delicious meal of local foods. 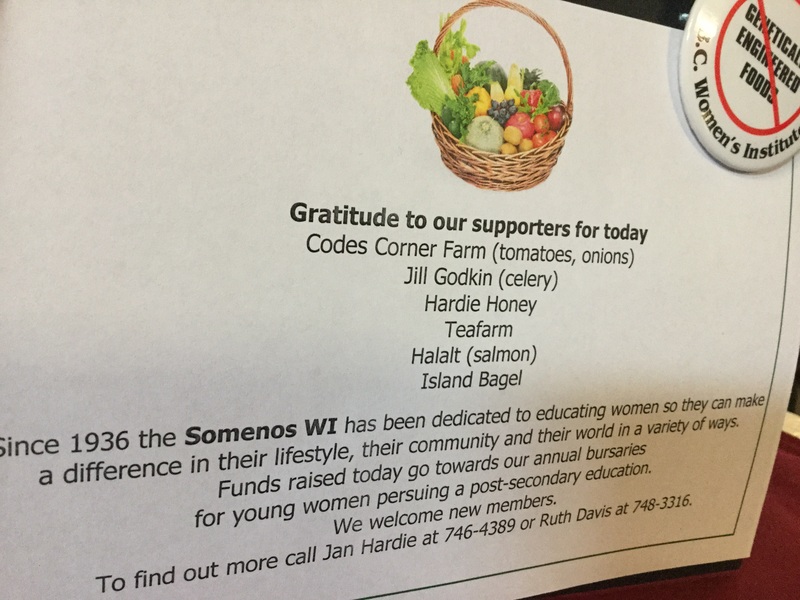 Jan Hardie explained that next year is the Somenos Women’s Institute’s 80th anniversary. Among other work, these women have and continue to raise money to help cover post-secondary education costs for local girls. They are always happy to accept new members. 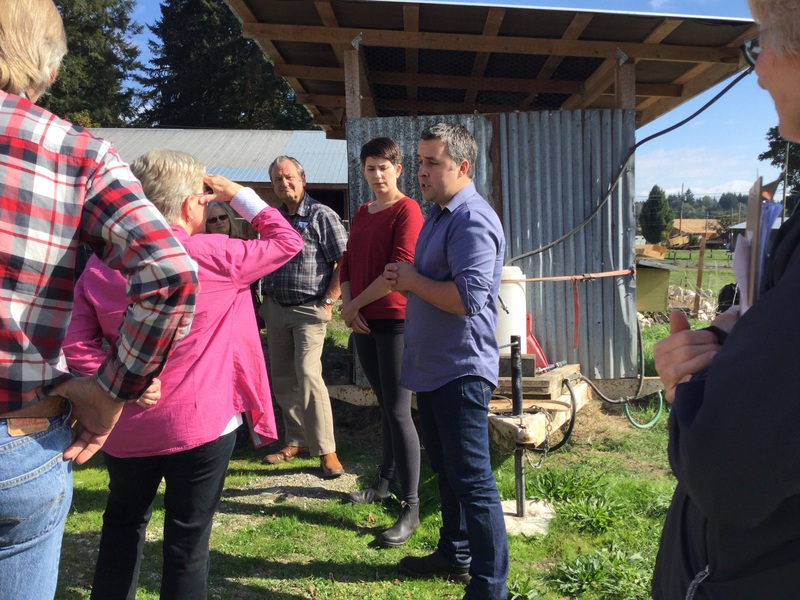 One of the benefits of this tour was meeting local farmers. Oliver Balme was my lunch companion. With full bellies, we were back on the bus headed to Happy Goat Cheese Company. 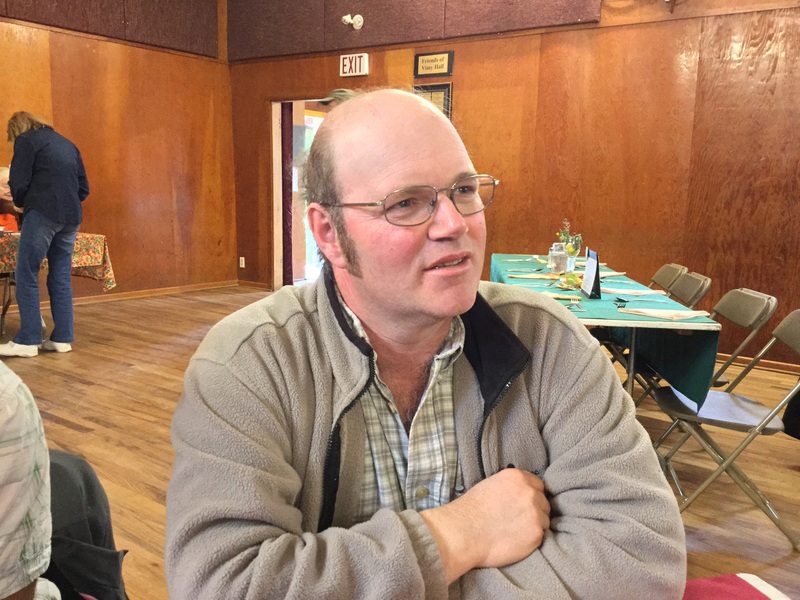 While en route, Koksilah-area farmer John Vanden Dungen took the opportunity to talk about issues that affect our farmers, like invasive elk, deer, and bears eating crops and destroying bales. Another issue echoed by others is there are too many levels of government and too many government ministries involved in decision making when it comes to farm-use approvals, which slows application processing times and is confusing to applicants. Next stop was The Happy Goat Cheese Company. 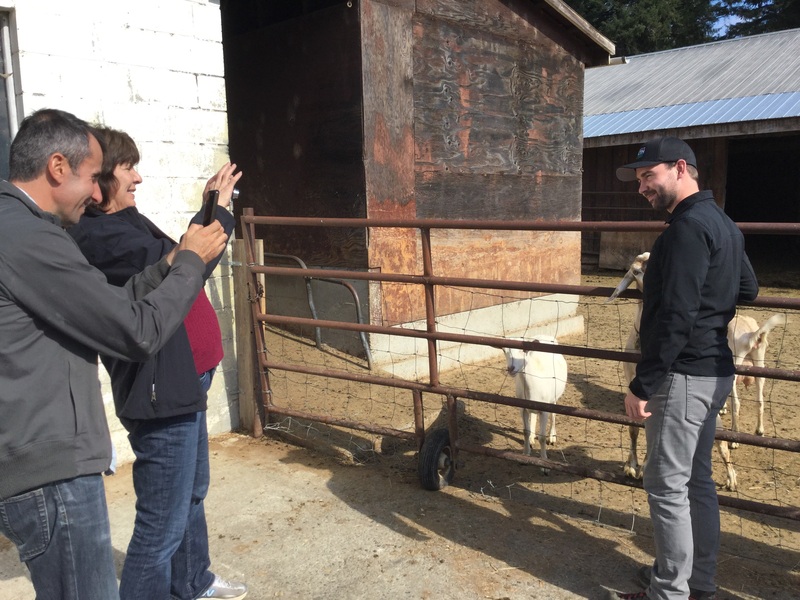 Owners Kirsten Thorarinson and her partner Cory Spencer showed us around their milking and cheese-making facilities. Their cheese is so sought after that they sell out every year. 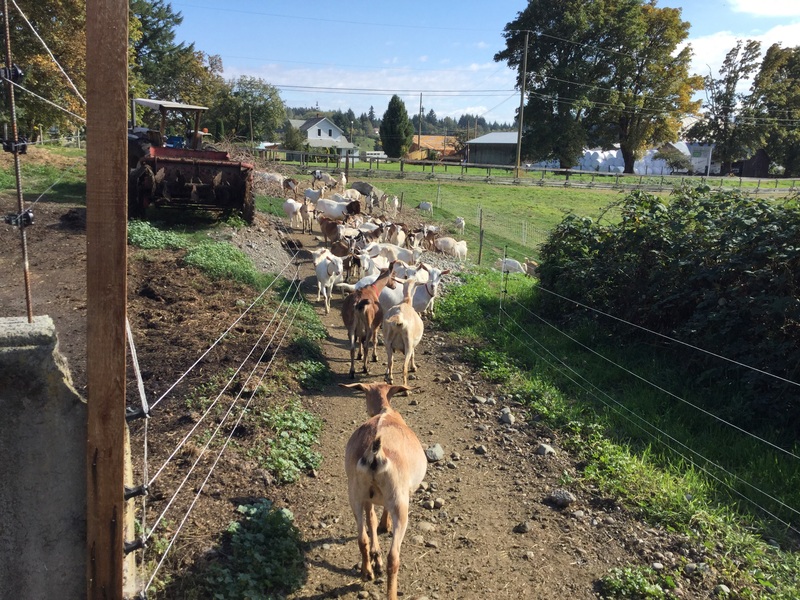 This industrious pair is increasing the number of goats every year to meet this demand. Cory is just back from two weeks in France where he took a cheese-making course, for which we will all be grateful when he puts his new-found skills into making new and tasty cheeses. I don’t usually like goat cheese, but their Tomme de Vallée changes everything. Two more stops to go. 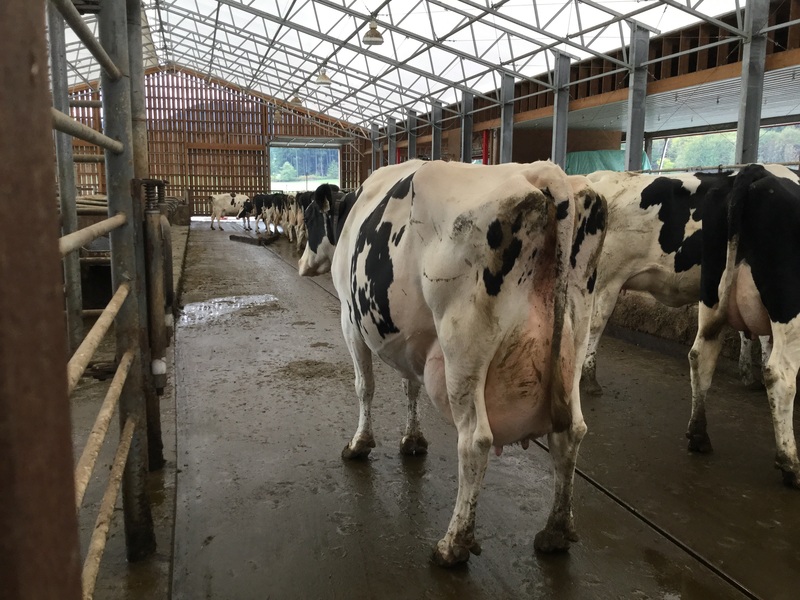 First up, the Van Boven Dairy Farm. 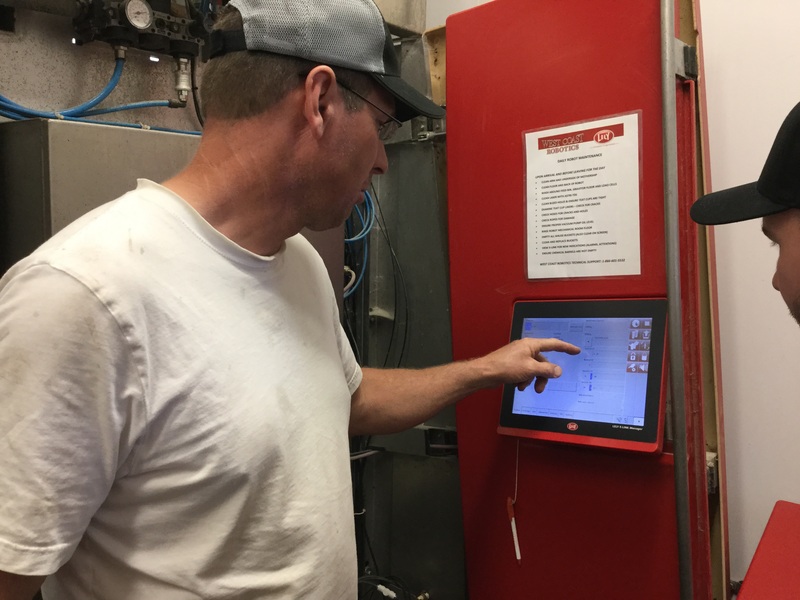 The Van Bovens have moved their dairy production into the 21st century. They use robots to milk and feed their cows. What this means to Margie and Ben Van Boven is they can now sleep through the night—no more 3 a.m. wake ups to milk and feed the girls. 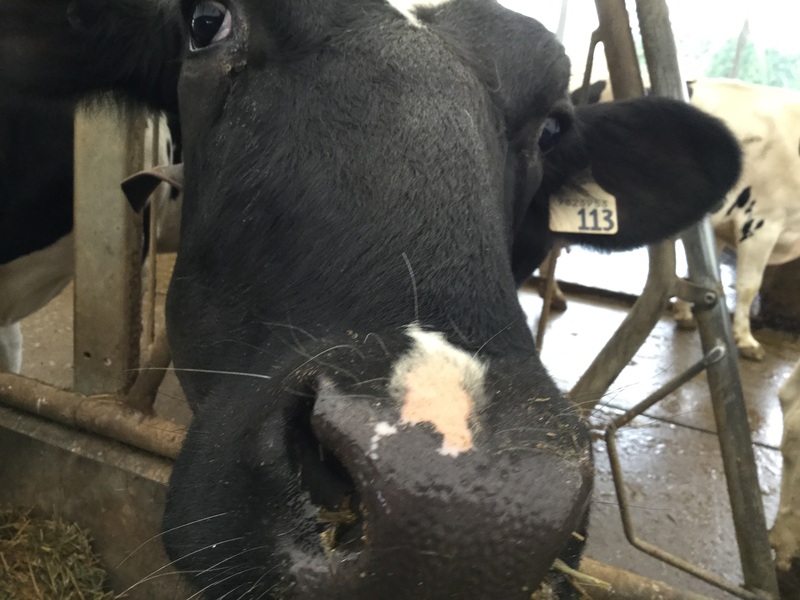 All the cows are outfitted with a chip, which identifies who they are, how much they weigh, how much milk they yield in a day, and more. The system is monitored by the computer (below). Ben can retrieve reports about these cows at any computer (including his phone) and can print reports to understand where the exceptions are. 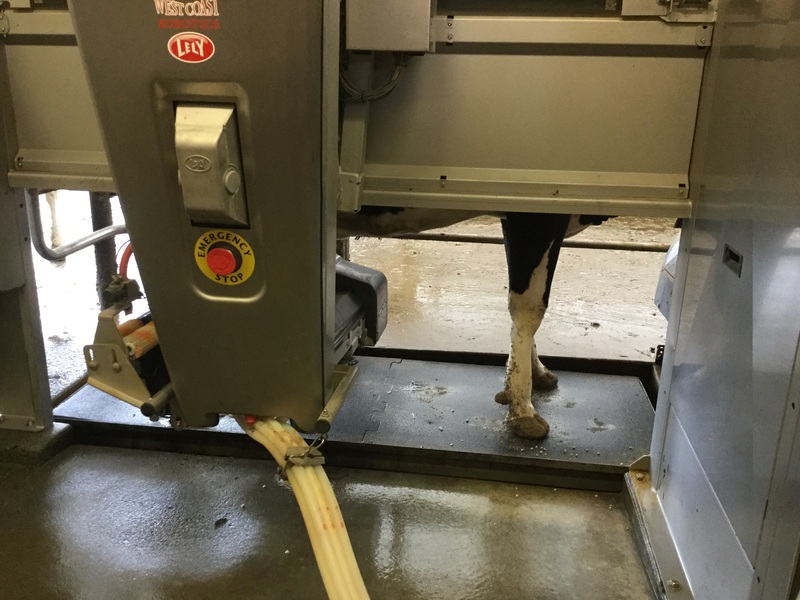 What you can’t see in the terrible image below is the mechanical milking “hands” that locate the cow’s teats, latch on, and pull out the milk. A fascinating process that during which the cows remain calm, likely because they are treated to special grain feed while at the machine. My only (and terrible) image of the milking machine. Time to visit the milking machine, me thinks. 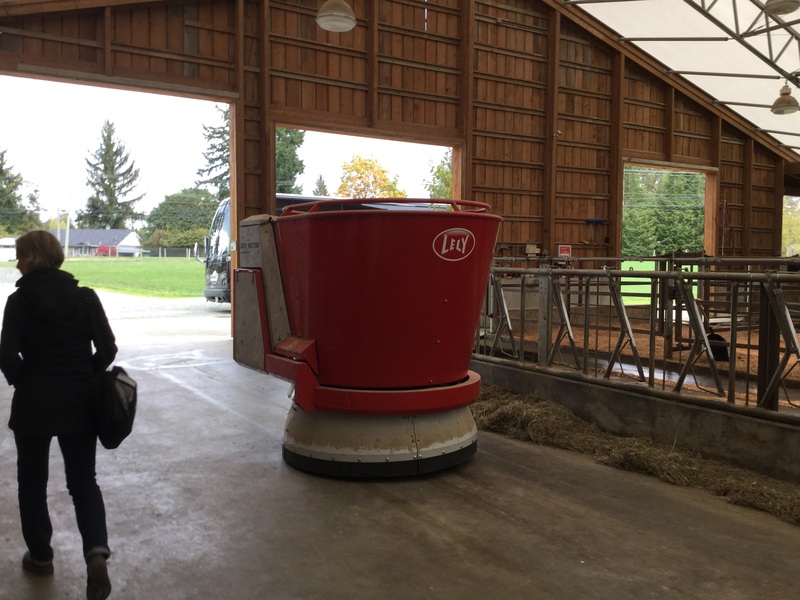 The red tea cup-shaped robot below feeds the cows. It drives itself along the corridor and checks to see that there is enough food for the cows, then adds food where there is too little. It’s like seeing R2D2 in real life. Our last stop was a welcome treat after a day of touring our lush valley. 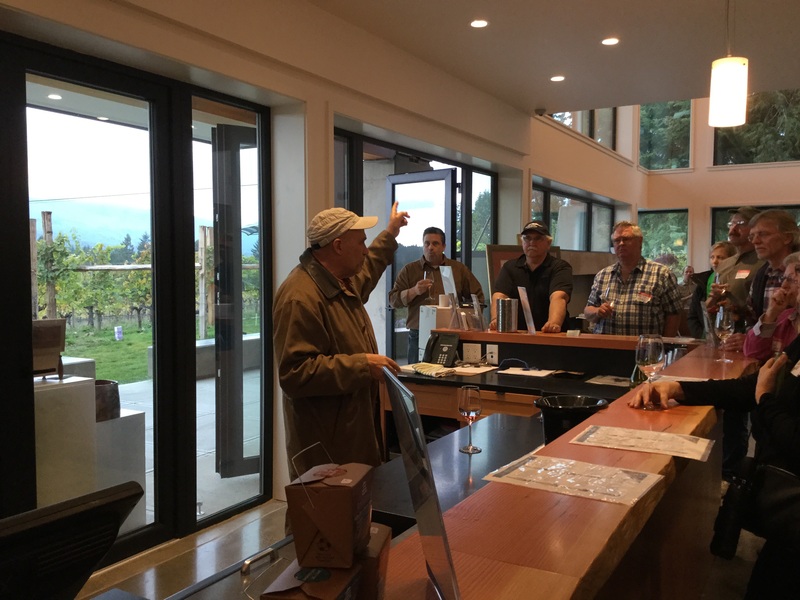 Tired but inspired we arrived at Blue Grouse Estate Winery for a wine tasting and chat with owner Paul Brunner. 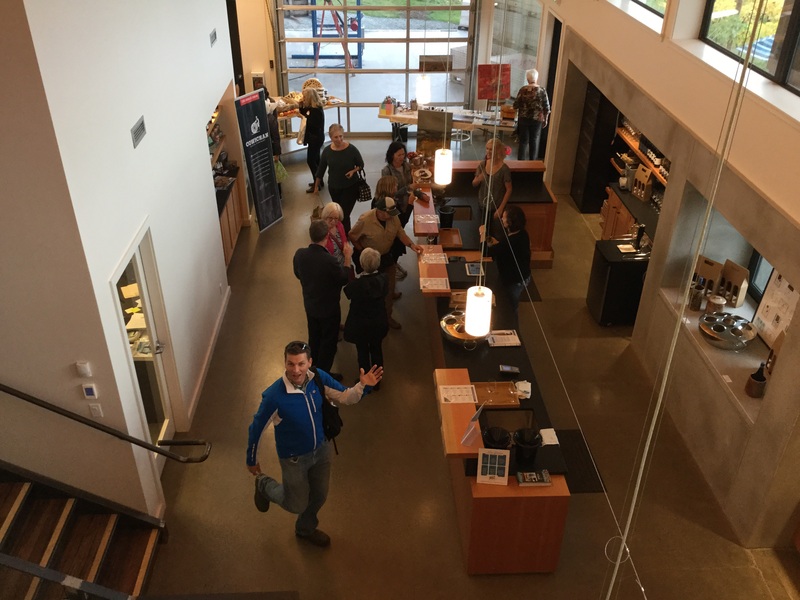 Blue Grouse is home to a new and gorgeous building that represents of the best in west-coast architecture with Live Edge Design counter tops, beautiful beams, and high ceilings with windows providing natural light. The wine was so good few of us left without a bottle in hand. Kerry Davis, CVRD Area Director for Mill Bay strikes a pose. Thank you to Bob Crawford, CAS president and Wayne Haddow for organizing and hosting this informative tour. 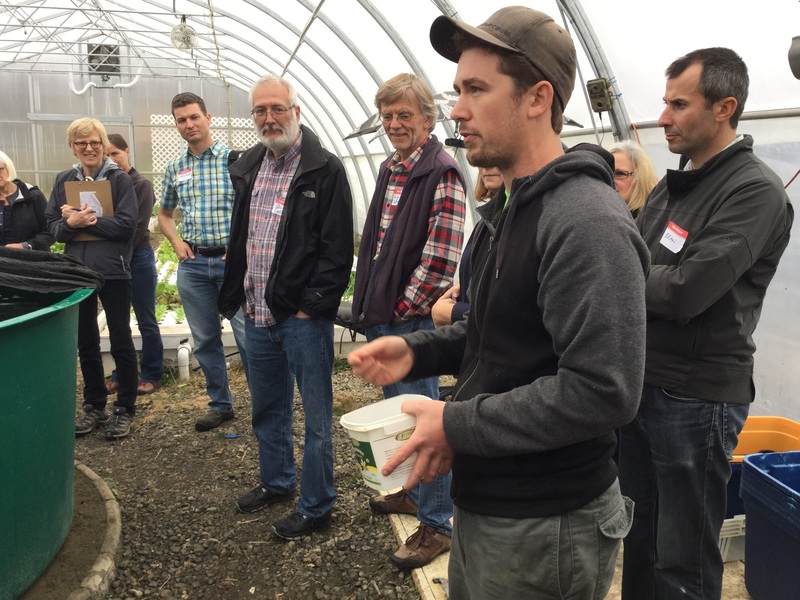 As chair of North Cowichan’s Agricultural Advisory Committee, this experience will help inform the actions we take. 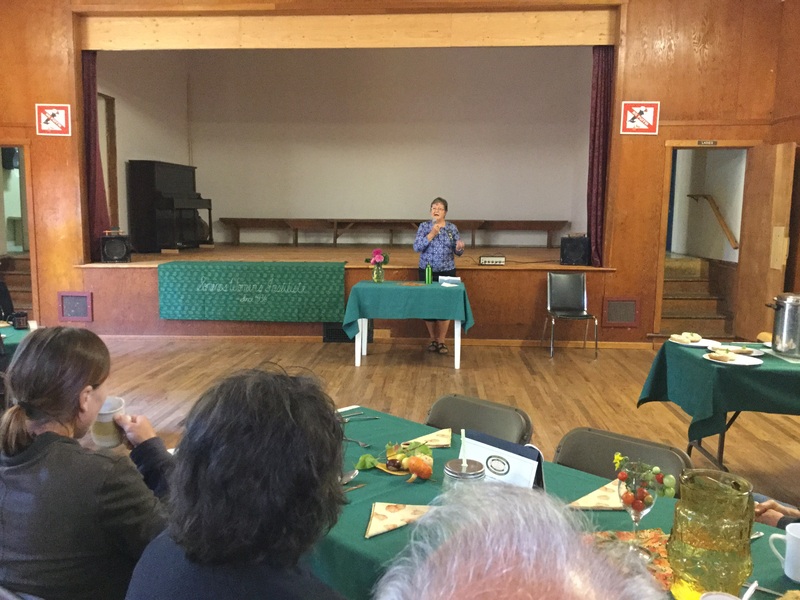 Hi Maeve, many thanks for your post on Cowichan Agriculture. I have written before about the need for support for local farmers in getting their product to market, storage, refrigeration, distribution and so on. I think this kind of taxpayer funded support for local producers would be much more widely accepted than the freebies heaped on local chambers of commerce who do little or nothing for local residents.